Hyaluronic acid is a molecule (polysaccharide) present naturally in our body. We can find it located in the epidermis, as well as different types of mucus. It acts as a component in the spaces between cells of tissues and is part of the extracellular matrix call or MEC, that allows to lubricate, absorb and transport the basic nutrients in the cells and eliminate waste generated in these. What is its structure as a molecule? 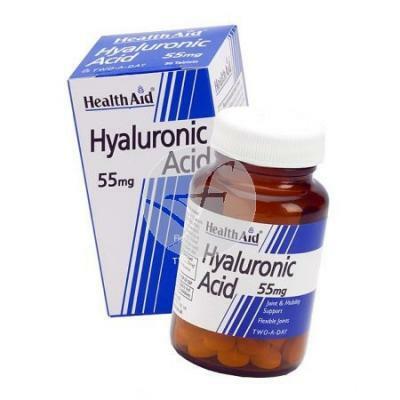 Hyaluronic acid is a glycosaminoglycan, i.e. a molecule or macromolecule due to its giant resulting from the merger of many equal molecules called disaccharides structure. This family of GAG or glycoaminoglycans is well known in the field of health since some molecules with a similar structure are used today in a wide variety of drugs and nutritional supplements such as e.g. : Keratan sulfate or chondroitin sulfate. The GAG may give rise to more complex and larger formations forming large molecular structures such as proteoglycans. Those proteoglycans that comprise or contain hyaluronic acid are those commonly found in the body's connective tissues such as dermis and cartilage since the main action of the chains in Hyaluronan mechanism is the absorption of water to maintain an optimum level of hydration in these tissues. Therefore the Oh molecule has a high capacity of attraction of water molecules, and in turn is able to expand and endure high compressions. other ingredients: phosphate dicalcium, microcrystalline cellulose, vegetable magnesium stearate, silica. Directions for use: as a dietary supplement for adults and children older than 12 years, one or two tablets per day. It must not exceed the daily dose expressly recommended for this product.